Big changes are in the gift shop’s future. Wondering what's behind door number 3? Bigger may not always be better, but when it comes to retail space, size definitely matters. 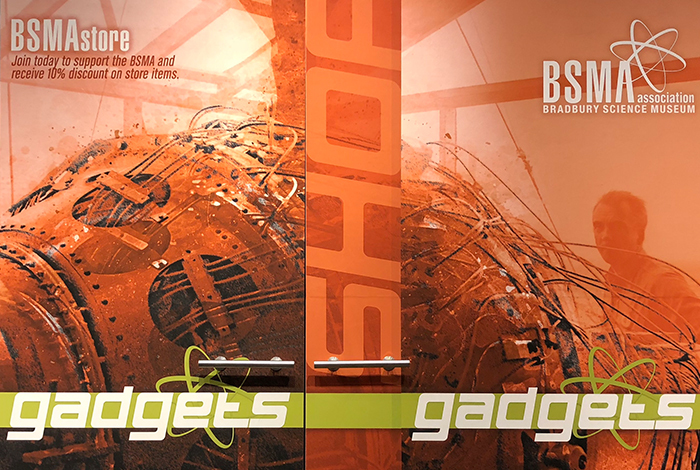 The Bradbury Science Museum Association (BSMA) opened its first tiny store, named Gadgets, in December 2017. It was really just a mobile kiosk, a set of shelves on wheels parked in the lobby of the Bradbury Science Museum. A bit unwieldy, it had to be rolled into place each morning and then put to bed each evening in the Museum’s recording booth. In spite of its diminutive size, the shop was extremely popular with tourists and locals alike, and sales grew each month. In fact, demand for the Lab-themed merchandise quickly outgrew the wee kiosk’s storage space and by July of that year, construction had already begun on a larger version, Gadgets 2.0. Officially opened in October of 2018, Gadgets 2.0 utilized a modern, fold-out design with attractive display spaces, four times the room for storage, and a detachable unit with a dedicated counter for the register. With these upgrades to Gadgets, the BSMA was able to increase the variety of goods for sale, and staff no longer had to move the store back and forth, a definite plus. At the same time, the BSMA increased its volunteer corps and extended the shop’s hours. Within a few short months, sales at the shop’s new storefront had jumped again and markedly increased funding for the association’s mission to promote STEM learning and scientific literacy for all ages. This upcoming summer, the BSMA has even bigger plans for Gadgets, though! Bigger may not always be better, but when it comes to retail space, size definitely matters. The BSMA board knows this and believes that with a little more square footage for their retail space, they can help even more students find a personal connection to science. But where to build? The Museum galleries are fully dedicated to the Museum’s mission to highlight the Lab’s innovative solutions to national global security challenges and to its cutting-edge scientific research. We simply don’t have space for a larger gift shop in the Museum. What we do have, though, is a wonderful relationship with TRK Management, owners of the Museum building at 1350 Central Ave., in Los Alamos. Long-time residents of Los Alamos, the owners of TRK Management, the Watermans, understand that the BSMA’s success in raising money for regional K–12 STEM programs contributes to our community’s shared success and they were quick to propose a solution. And what, you may ask, is that solution? Well, it’s a simple plan accommodating the BSMA’s desire for additional retail space, the shopping public’s requests for an expanded selection, and the Museum’s requirements for current and future exhibition and informal science education programs. TRK is converting space just outside the museum into a brick and mortar store. The store and Museum will share a couple of common walls and doors, but the store will truly be its own entity.